Recently me and my girlfriend Agnieszka went to Hawaii! Since this was an interesting trip and indeed one of the best ones in my life, so I decided it is worth describing here. Most of this post is just general description of what we did. Some things that attracted my attention the most, I describe in more detail. But first and foremost it is just a bunch of awesome photos from that place. I also hope that if some people would be planning the trip in the future they can get inspired here, as well as learn from our mistakes and avoid them! O'ahu (The Gathering Place) - the most popular one highest population (1 mln people) and 3rd w.r.t. total area. Especially south of the island is crowded with tourist. The most popular airport - the one near Honolulu - is here. 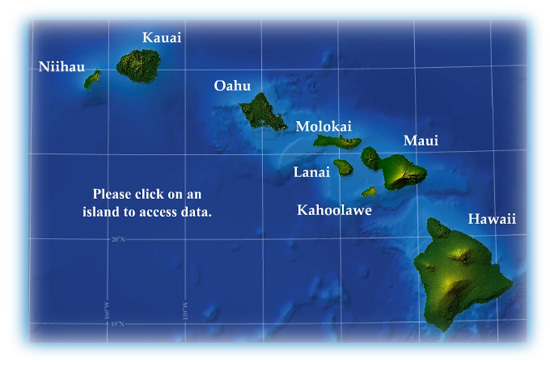 Hawaii (The Big Island) - as the name suggest this island has largest total area. It continuously grows due to volcanic eruptions. It has richer flora and fauna than the rest of islands and it's easy to find beautiful and empty beaches, so that one can enjoy Hawaii undisturbed by other people. Maui (The Valley Isle) - the second largest island, with similar population size to Hawaii. This island looks like a proliferating bacteria. The left one has more cities and really nice, sandy beaches. The right one is more wild and has spectacular landscapes and a volcano in the middle. DO NOT WASTE TIME ON TRAVELLING BETWEEN ISLANDS. DO NOT VISIT MORE THAN 1-2 ISLANDS A WEEK. We did visit two island during a week we spent there and that was already too much time wasted on travelling. Our choice was O'ahu (because we found the cheapest tickets from US mainland to O'ahu) and Maui (because friends recommended it). The reminder of this post is a chronological description of our trip. We arrived around 10PM local time, it was already dark, and we still needed to travel about 25 miles to the hotel in Waikiki. The first thing that happened to us was meeting a local old lady. I didn't really know what to expect. I thought that local people will be either very kind and happy people detached from a mainland problem, or very grumpy ones that are fed up with the omnipresence of the tourists. Fortunately, she turned out to be a very nice person. She was waiting for a bus home, after finishing work at the comm tower the airport. She was relaxed, talkative and helpful to us, explained how the bus system here (called TheBus) works, including how to beat the system and get everywhere faster but stopping at secret communication node, that is not on the schedule. The bus took about 1h (~ 30 stops) to get to Waikiki, which was a bit long, but we saved some money on Taxi ($5 compared with $30) and we saw a bit of Honolulu. Upon arriving in hotel we were suprised to find out that there is no door in the hotel. The lobby had a large opening in front wall which could not be closed. Probably due to the fact that it is never cold here. We got back to the hotel, unpacked, checked out the view from balcony (that failed - it was already dark) and went straight to sleep (time zone difference helped in US it was already 3AM). First thing the was checking out the view from the balcony. It was spectacular (on the left). It's hard to build roads on the island so there's few of them and the traffic is high. HANAUMA BAY CLOSED ALL DAY ON TUESDAYS. After that we decided to go to Hanauma bay (the one that was closed the day before). There was quite a lot of people (but not overcrowded) and we had to pay $7.50 for entry. It was indeed an interesting place for snorkeling, we saw lot of interesting fishes and some sponges and sea urchins being part of the coral reef. At that point it started getting dark. We saw some brutally run over animals on the road (watch out!). We also stopped at some beach after it got dark to take some photos. It was magical! The third one was visitor entrance by a bridge (with restriction that only military can use left lane of the road) - here we also managed to turn around without getting shot :) Summing up we only saw Pearl Harbor from far, but it was still pretty awesome, you could see a lot of lights there and we some the shadows of giant military ships! OK enough for today, in part II I will describe or trip to Maui. I personally liked Maui much more because it was much less crowded and there was more wildlife. We also meet over 1 meter long turtle ! شركة تنظيف كنب بالرياض https://is.gd/ltlPJm عند تجمع الأتربة على أقمشة الكنب أو اتساخها بالبقع التي يصعب إزالتها فإن ذلك يبعث على النفس نوعا من الانزعاج ,و عدم الراحة خاصة مع هبوب العواصف الرملية و تجمع الأتربة الأمر الذي يزيد المشكلة تفاقما ويزيد النتائج سوء . افضل شركة مكافحة الصراصير بالرياض https://is.gd/Bo664I تعد الصراصير من الحشرات المنزليه المقززة التى يخشاها الكثير من الأفراد ؛ولها أشكال وأحجام مختلفه ؛فالصراصير لديها ألوان سوداء أو البنى القامت ولديها شعيرات فى الوجه ؛وتتمكن من الوصول الى الأطعمة الخاصه بها عبر مجموعه من قرون الاستشعار التى تساعدها على الاستدلال على أماكن الأطعمة ؛فقط نحن شركة مكافحة حشرات بالرياض . شركة نقل اثاث بالرياض https://is.gd/ENzdHG نقل عفش بتعتبر أعمال نقل العفش من أهم الأعمال على الاطلاق ؛فالكثير من الأفراد يحتاجون الى القيام بأعمال النقل المميزة لحمايه كافه أجزاء الاثاث من التعرض للتكسير أو الخدوش وغيرها من الأمور الأخرى ؛لذلك نحن شركة نقل عفش بالرياض التى تعتمد على أفضل العاملين المتخصصين وأفضل الأساليب الحديثة للقيام بنقل جميع أجزاء الاثاث سواء غرف النوم والسفر والصالونات وغيرها من الأدوات المكتبية والأدوات الخاصه بالأمور الفندقية وغيرها من أجزاء الاثاث التى تتعلق بالشقق والقصور والفلل وجميع الأمور الأخرى .